Twizzler turns 11 – What is new in Twizzler-land? 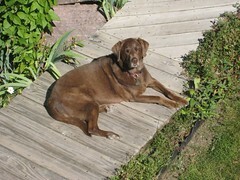 Our faithful, loyal, beloved family chocolate labrador turned eleven years old yesterday. We were up in Redstone, Colorado at Gram’s cabin to visit her and extended family, so Twizzler had plenty of well-wishers. In this picture, she is basking in the Sunday sun on the path from Gram’s backyard to her back door. For 11, Twizzler still moves well and is in very good shape… we see some signs of her slowing down a little, but she still lives for her daily walk, especially when the weather is cool. Happy Birthday Twizzler – we love you! One Response to "Twizzler turns 11"
I can’t believe I missed her birthday! I hope you told her I loved her and was sorry I couldn’t be there to celebrate with her. September 7, 2006 Twizzler is 9! September 7, 2005 Happy 8th B-Day Twizzler!